What is the My School Lunch website? My School Lunch raises awareness of school lunches whilst educating children, their parents and teachers about healthy eating and an active lifestyle. With My School Lunch, local authorities can work together to promote their own catering service in a way that is appealing to children and their parents. 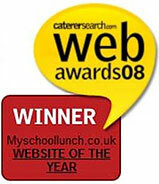 If you are interested in the My School Lunch website for your own school meals catering service then please contact Karen or Arnold Fewell. An interactive platform to add value to your school meals service by educating children about healthy food choices. An online presence for informing parents about lunchtime menus, your school meals service, compliance with diet and nutritional guidelines and offering a convenient feedback opportunity. A link between the dining hall and the classroom with a funfair of educational games all linked to key stages 1 and 2 of the National Curriculum and the Welsh curriculum. Lesson plans and worksheets for primary school teachers to use the website and achieve curriculum aims. Cost efficient digital and traditional marketing tools by working with the network of existing local authorities throughout England and Wales. To see examples of the website, please click on the buttons at the top or down the right hand side of this page. To see the full sites of the authorities taking part please select the authority from the drop down list above.